Ideas for organizing clutter begin with your approach to organization as a daily activity. For many people, tackling household organization to remove clutter may seem like an insurmountable task, but anyone can do it - you just need the right tools. Tonia Tomlin advises her clients that the first step towards organizing clutter is to tackle it bit by bit. Opening a door to a room stuffed to the ceiling with boxes seems insurmountable, but you don't worry about the boxes in the back, you start with three or four boxes from the front. How Can I Reduce Clutter Right Now? By chunking your clutter, you build on your own success and avoid being overwhelmed. When you begin organizing your clutter, start in one room and use a sorting system to decide what items to keep, what to throw away and what to donate. When it comes to keeping items, sort items that belong in other rooms so that you cut down on the amount of running back and forth and you have another opportunity to eliminate excess clutter. 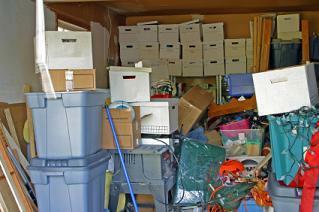 When it comes to sorting clutter, how do you decide what to keep and what to get rid of? The following three steps are a simple method for taking ownership of your clutter and deciding what to do with it. Are the items damaged (i.e. cracked, broken)? Are they unsightly or unusable? We like to hang onto items for sentimental reasons, but items that are broken, cracked, unsightly and likely never to see the light of day do not need to be kept. When was the last time you used or wore the item? One source of clutter is old shoes, purses and clothing. It's not unusual for women to carry a favorite purse and replace it periodically. Unless you have a purse for every outfit and swap it out regularly, you likely have a collection of clutches hogging space somewhere. If you haven't used or worn an item in more than two years, it may be time to donate it. Is your clutter seasonal? Do you have Christmas decorations out until February? Easter decorations lingering in June? Dreading Halloween before you've even gone school shopping? Seasonal clutter is popular in most households. Create a space in your closet, attic or garage that is for seasonal storage only. Label your storage bins for the season that the decorations belong in. Make it reasonably accessible and set aside specific days in your calendar for the packing and unpacking of seasonal clutter. The answers to these questions will tell you whether to keep or get rid of a seasonal item: Do you have more Christmas stockings than you do family members? What about half-burnt or melted candles? Are your ornaments damaged or broken? Teaching children free ideas for organizing clutter is easier than you may think. It requires a regular commitment on both your part and the part of the child. From a young age, you teach a child to put things 'back' where they go: blocks into their tin or books on their shelves. The same principle applies as a child gets older. Trash and bits of paper go 'back' where they belong in the trash bin while toys should all have a proper place to be returned to whether it's a toy box, a set of drawers or shelf space. With regular reminders children learn that they must put up one set of toys before getting out another. That they cannot play in the living room, then leave their toys all over the floor while they move on to another room. Make the process simple and straightforward for your children. Put a laundry basket in each room that you can place their clutter in when it is left behind. Make it their job to periodically empty those laundry baskets and put their items up. Make sure a trash bin is accessible to their bedroom or playroom and that it is emptied regularly. This bin should only be for papery bits and not food or drink. Organizing clutter begins and ends with the simple act of taking a few minutes here and there.